Injection molding powerhouse Arburg had its best result in history last year. Consolidated turnover amounted to €548 million while value of incoming orders is 15% higher than 2013 in euro terms. 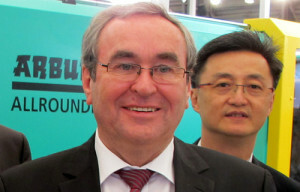 Because of the booming automation business in China, which is growing “over proportional” as described by Helmut Heinson, Arburg Managing Director of Sales, the company is building up an expert team for automation and turnkey businesses in China. “We will have a group of specialized engineers in both Shenzhen and Shanghai,” he announced. At CHINAPLAS 2015, Arburg celebrated the official Freeformer sales launch in Asia. This additive manufacturing technology allows fully functional parts to be 3D printed with standard plastics granulate. As with injection molding, the granulate is first melted in a plasticizing cylinder. Plastic droplets are applied layer-by-layer onto a moving part carrier via the nozzle of a stationary discharge unit by means of high-frequency piezo technology at a specified duty cycle of 60 to 200 Hertz. A second discharge unit can be used for an additional component in order to produce, for example, a part in different colors, with special tactile qualities, or as a hard/soft combination. The Freeformer was officially available in Europe after Fakuma 2014. Heinz Gaub, Arburg’s Technology Engineering Managing Director, said there are basically two kinds of customers showing interests in it. Another interested group is the prototype service providers or product developers who need to create samples and adjusting them in a short time frame. In this case, the Freeformer offers a distinctive advantage – the decidedly cheaper material cost. “The Freeformer can produce truly functional parts with a material cost that is 10 times lower than traditional 3D printing,” emphasized Mr Heinson.